Today, there are different approaches to style and trends but we can’t help be influenced by people close to us. Growing up, I had to wear anything my older sister wore. Our 14-month age difference made it easy for us to share clothes and shoes. If she chose to wear her pink jellies (shoes), I wore my equally adorable pair. We were 5 and 6, at the time. But, of course, my style is distinctly mine. This memory came to mind when I approached sisters, Shey and Lia, with their mom at the Litchfield Native American Fine Art show over the weekend. 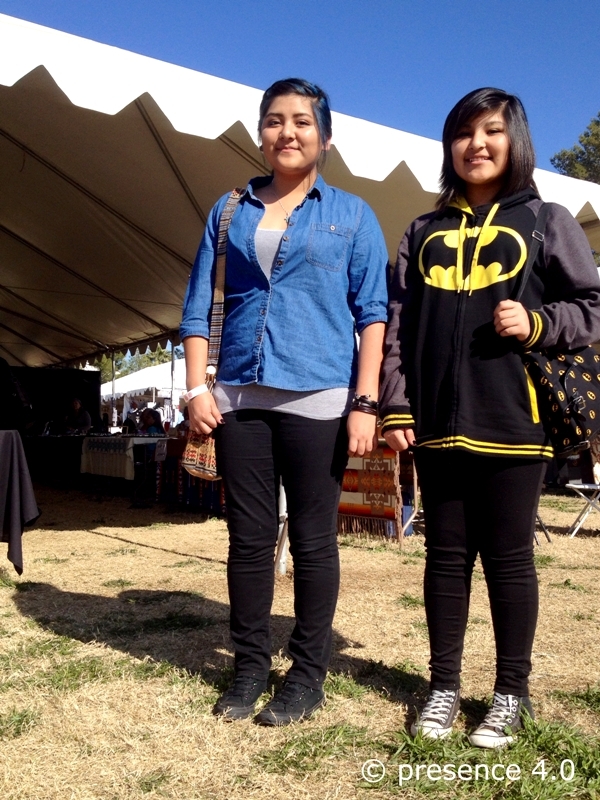 Naturally, these Hopi/ Mohave girls didn’t know how to describe their style and settled on “edgy” and “casual.” They are teenagers, one is in middle school and the other in high school. Shey’s blue hair streaks, ear cuff and woven hand bag were indicators of a young lady growing into a fun, edgy style. Then, there was Lia’s obvious penchant for Batman and Marvel comics. As it turns out both girls had a lot to say about comics. They preferred Marvel superhero shirts over DC comic superheroes. They don’t relate to the “super” powers of Wonder Woman and Superman, but prefer the heroes that “learn stuff” and are “more smart.” One of the girls remarked, “Spiderman is a kid who goes to school.” Well said, ladies! It was wonderful hearing their perspective. Later, I met their father (shown in the photo below) and their older brother. Both men were showing their wood carvings that weekend. And, it was the brother who introduced the girls to the politics of superheroes and has become someone who has influenced their style.